Election promises? Not worth a cent! What happened to the "no cost to ratepayers" promise Tom? Today we learn that the council have again committed yet another $2 million of rate payers public money towards this sheer folly, all in closed session of course and behind closed doors so rate payers don't see. How much is that now wasted? $3 million? $5 million? More? Add in the public servant man-hours and wages lost and it would be significantly higher than this. What is the opportunity cost of wasting good money after bad? What about the "port of call only" promise? What about the promise that "it has to demonstrate that it will not impact on our surf"? Nope, those boxes have massively failed the tick. Tate's election policy clearly said "the facility will be basic, to keep costs low" but now it's a nearly half billion dollar behemoth of a full industrialised home port? 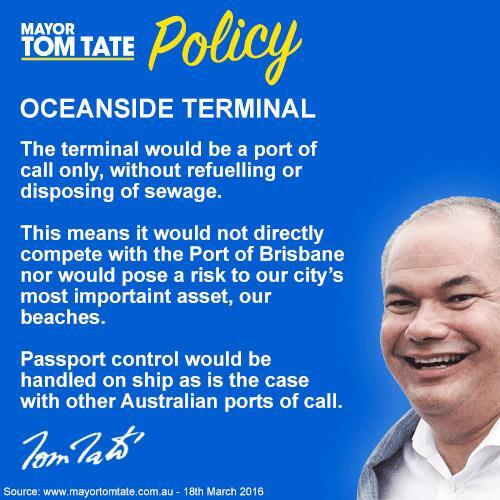 Port of call, no refueling, no sewage, not competing with Brisbane ... that's what Tate sold the voters in the days leading up to the election - seems absolutely none of it is true at all though. So much for any of Tate's election policy promises - appears they're all out the window now and not worth the breath used to speak them nor the paper they were written on. A local government election can NEVER deliver a mandate on any singular issue. Under our country's system of government there is no such thing as a mandate for any local mayor. Even IF there was such a thing, which there is most certainly not, nothing the mayor campaigned with or promised is in his current proposal anyway, and none of his current proposal has been to any consultation or community input action whatsoever. Aside from the words "cruise ship terminal", this current and vastly alternative apparition of the proposal has never been taken to the people.